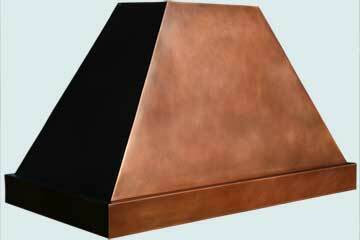 Handcrafted Metal makes copper pyramid range hoods that are customized to accommodate your kitchen and your taste. With us you can customize every dimension and feature, such as hammering, color tone, and lighting. 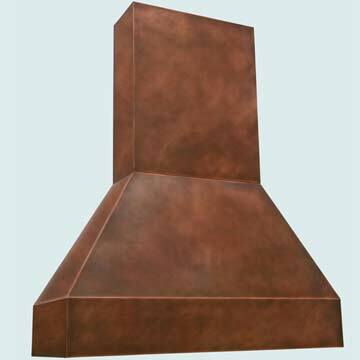 To further customize your copper range hood you can also choose from additional features, such as elegant bottom bands, hand-wrought straps, clavos, and rivets. Personalized features like these are guaranteed to please. 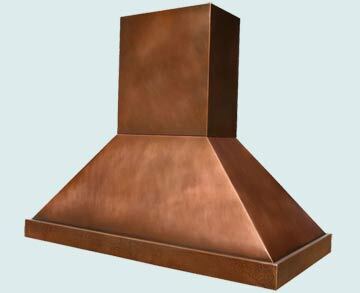 Our Copper Range Hoods are made with the purest copper available, and are very durable. 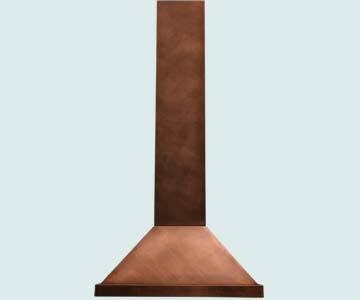 We will work with you to make a superior copper hood that looks splendid in your kitchen. 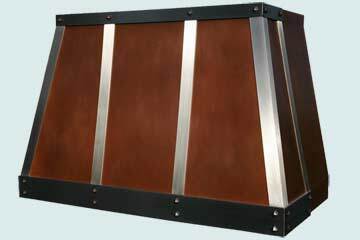 Click on any pyramid hood below to see more pictures, and customize it according to your specifications! This classic Pyramid hood has perfect proportions. It includes a Stepped Bottom Band and a square stack attached at the top. Both pieces are made from 48 oz copper and are finished with our Medium Antique patina. 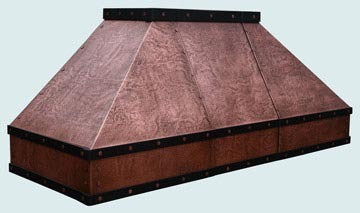 This Pyramid hood is shown with one horizontal strap located on the lower band. The strap is made from brass and has bronze clavos fasteners. The body and stack are made from 48 oz. copper, and the entire piece is finished with our Medium antique patina. This lovely smooth hood has a medium patina and a hammered band. It is extra wide at 34" to cover a big stove on the island. The hammering on the stepped band gives contrast to the smooth hood and stack. 48 ounce copper is fully welded and polished. 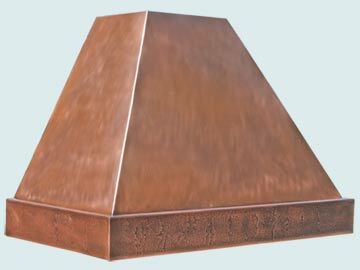 Round moldings at the top and bottom of the band dramatically change the character of this copper pyramid island hood. The recessed band between the moldings gives definition to the simple pyramid geometry. A small structural stack provides a rigid ceiling mount. 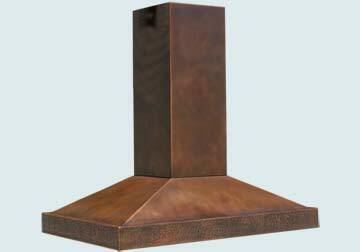 The entire hood is made from 48 oz copper and is shown with a Medium antique patina. 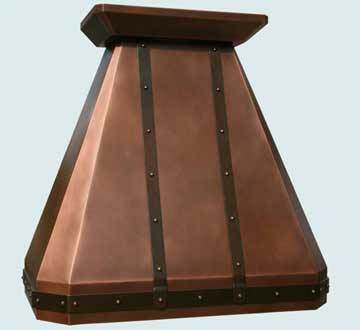 This Island Pyramid hood includes several decorative straps. The straps are made from steel and attached with solid flat head brass rivets. The entire hood body has our Reverse Hammered texture and is shown in a Medium Antique patina. The hood and stack are both made from 48 oz. copper. 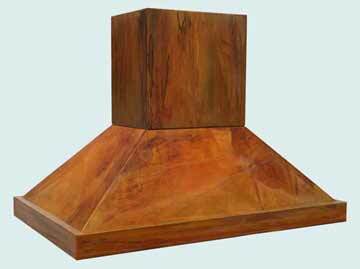 This Pyramid hood features a square stack located at the top. The bottom band has our Random Hammered texture applied to all sides. Both the hood and stack are made from 48 oz. copper and are finished with a Medium Antique patina. 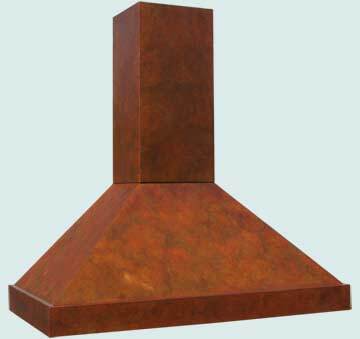 This tall Pyramid hood features two horizontal straps on the bottom band and one at the top. The straps are made from darkened steel. 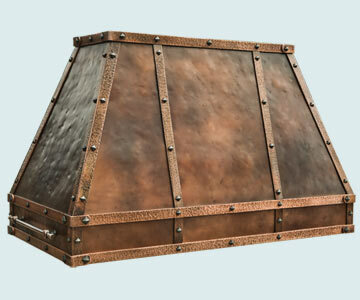 Additionally, there are two lap-seams that run up the front face, which are adorned with solid copper rivets. The entire hood is made from smooth 48 oz. copper and finished with our Medium antique patina. This richly textured hood is loaded with features. 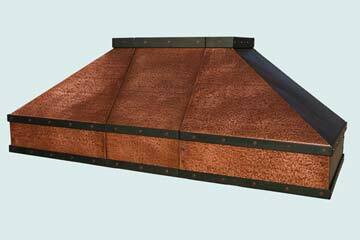 Hammered copper straps, heavily distressed hood texture, strongly patterned multi-layer patina, copper pot rails, and bronze clavos all work together to produce this spectacular copper hood. The horizontal straps at top and bottom have corner gussets that overlay the straps on both sides of the corner. 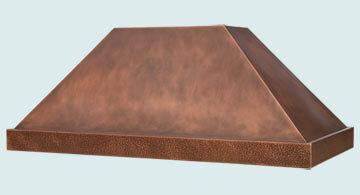 The filter plate is also copper to complete this tour-de-force of copper hood fabrication. Heavily distressed all-welded 16 gauge copper hood, multi-layer patterned patina, fully random hammered 1/4" thick solid copper straps. 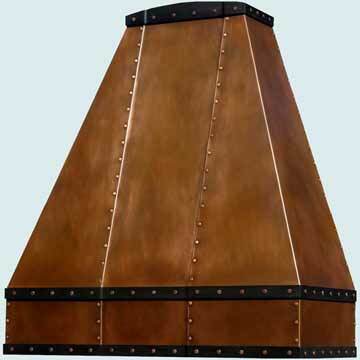 This traditional Pyramid hood is shown with our Medium antique patina. The stack at top can be extended to reach any custom ceiling height. The entire hood is made from 48 oz copper. 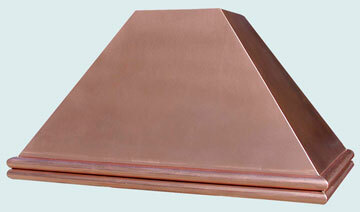 This Pyramid hood includes a Stepped Band at the bottom edge. The top of the hood has a square stack which stretches to reach the ceiling. Both the hood and stack are finished with our Medium Antique patina. The entire piece is made from 48 oz. copper. 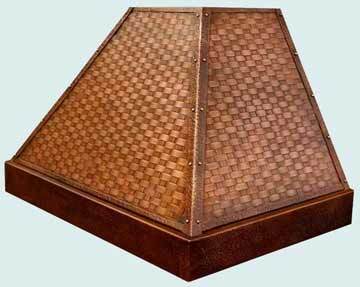 This Pyramid hood included a special curved front to change its profile. The top of the hood was also curved to match the ceiling arc. The entire hood was made from 48 oz. copper and is shown in our Medium Antique patina. 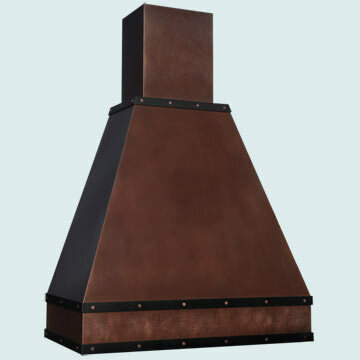 This Pyramid hood includes ornamental stainless straps. 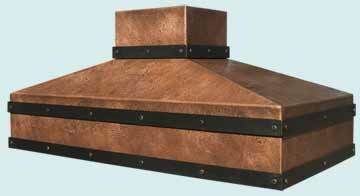 The straps are attached with small Pyramid Clavos and give the hood a craftsman style appearance. The entire hood body is 48 oz copper and is finished with a Medium Antique patina. 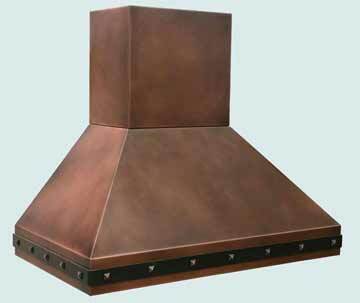 This Pyramid style hood includes a Double Bullnose band with recess. The body of the hood was made very low profile to minimize is large size in the room. 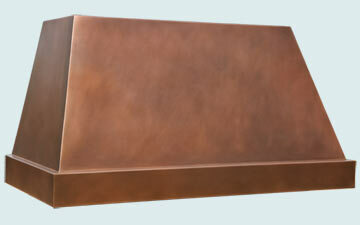 The entire hood is made from 48 oz copper and is shown in a Medium antique patina. 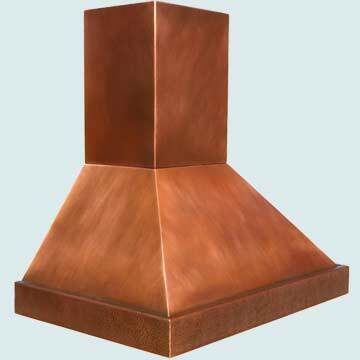 This natural copper hood features a unique double bullnose band at the bottom. 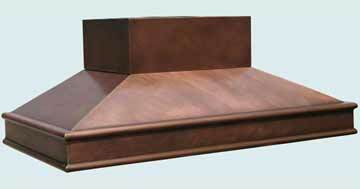 Each bullnose is one and five-eighths inch tall - the same as the bullnose on our counter tops. This is a great way to match hood and island top in your kitchen. The copper is finished with a natural matte look. 48 ounce copper is fully welded and polished. 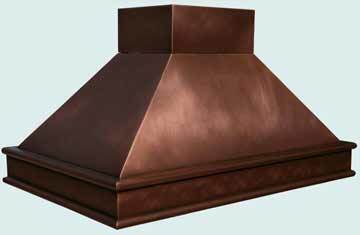 This Pyramid style hood includes an extra wide stack at the top. The bottom band of the hood is also made extra tall, to preserve the proportions of the hood. The entire hood and stack are made from 48 oz. copper and finished with our Medium Antique patina. 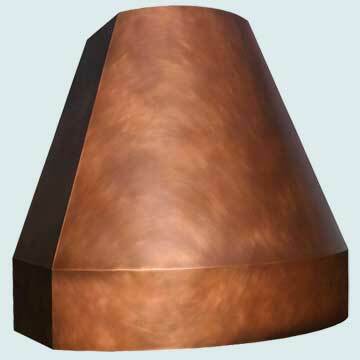 This custom copper hood features a pyramidal shape and has a bottom band that's been textured with our "Random Hammering" technique. 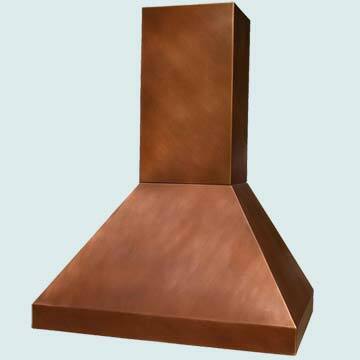 The entire hood is made from the purest copper available, and has our "Medium Antique Patina" finish. 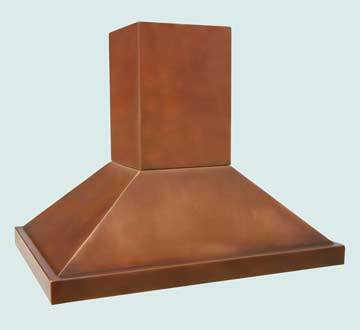 This classic Pyramid hood includes a tall stack designed to reach a vaulted ceiling. The entire hood and stack are finished with our Old World Patina, called Renoir. 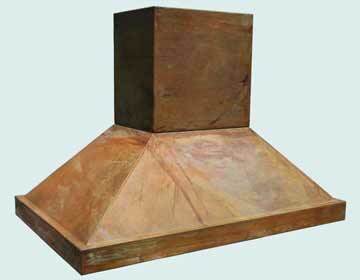 This Pyramid hood includes on of our Old World patinas called Ginseng Tea. The hood also has a stepped bottom band for added detail. The stack at top is also finished with our Ginseng Tea patina. Both the stack and hood are made from 48 oz copper. 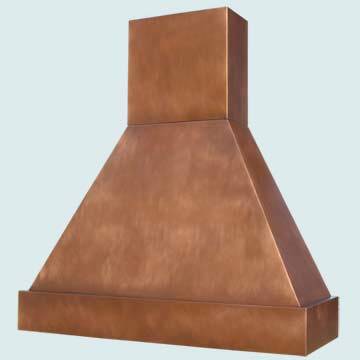 This Pyramid style hood includes a square stack at top. The lower band is Stepped out and the step wraps around all sides. The entire hood and stack are finished with our Old World Patina, called Apricot Brandy.